Here is a little birthday treat for all your RubyRaeLove fans, i promised two days ago that i was going to be having a giveaway and here it is, well here is the start of the giveaway. I have spent all weekend making new pieces for an up and coming photoshoot of my pieces, so along the way i thought i would make a few pieces for the giveaway. 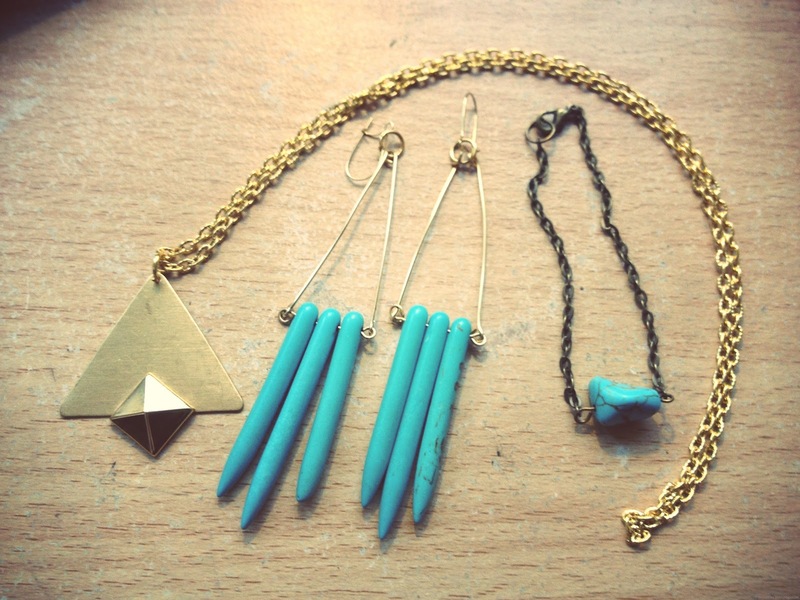 If you win you will recieve these wonderful spike Turquoise earrings and a turquoise nugget bracelet along with my new (one off piece) Aztec triangle necklace. You have to be a follower/reader of ella, you can only enter once, all you have to do is (comment) enter your name email address or anyway for me to contact you when i draw the prize. Leave a comment below so you can be entered into the draw. It is open to all international and uk readers. Happy birthday again to RRL! those pieces are bloody gorgeous especially that necklace! Already following, congratulations Ella I remember when you opened it! ooo lovely! Turquoise is my favourite colour at the moment. ohhh these pieces are lush! Congratulations on the 1 year birthday, you must be so excited and happy! i remember you opening it too, ella. happy first birthday rubyraelove, please put my name in the hat! My email is samirific@live.co.uk, I'd love to enter! happy birthday ruby rae love! So in love with that necklace! trying not to get my hopes up! You're pieces are beautiful! pick me! I follow you on google reader. I love every single one of your lovely pieces!! Oooh, these are so different and gorgeous! Such a lovely giveaway! Soo want them! Thanks for the giveaway! Love turquoise and golden shades together! Love this giveaway and your blog! My birthstone is turquoise. Oh, your jewellery is so pretty, please enter me. My email address is suzannelister1@gmail.com. aw happy birthday ruby rae love. what a lovely giveaway, forever wanting everything from your shop hehe. what beautiful colours, must have those earrings! These pieces are outstanding 🙂 and turquoise is my favourite colour! Please let me enter your giveaway ! Happy Birthday! And congratulations for all of your Sucess!! Beautiful prices your giving away, especially love the style of those earrings!! I love a good pair of dangly eargems. just found your bigcartel website through someones blog and love all the beautiful pieces you make. so glad youve got a blog/twitter so i can follow you and keep in touch with your site as everything is so beautiful! The jewellery is gorgeous! I adore the earrings. Love the jewellery:) Especially the necklace. i love all of the turquoise, happy birthday!